Bringing a city built by animals to life is a challenge – this book shows how the Disney artists did it. Packed with comprehensive notes on concept art and design choices, The Art of Zootropolis is an artist's world building bible. Zootropolis, Disney’s 55th animated film, has been the surprise critical hit of the year. Its story envisions a world entirely created and populated by animals – and this book examines the unique art challenges that seemingly simple idea presents. For example, how do you design a world that’s accessible to both a mouse, an elephant, and every other creature in between? 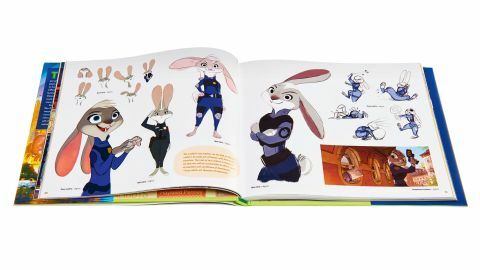 Written by Jessica Julius, with a preface by John Lasseter and a foreword by the film’s directors, Byron Howard and Rich Moore, this hardback beautifully reproduces both final and cut art from Zootropolis. And for fans, that might justify the cover price alone. But that’s only one half of the story. The smartly structured chapters also take deep dives into the thinking behind the look of the film: both its inventive characters and astonishing, imaginative environments. Zootopia’s buildings were designed with animal shapes and patterns. It’s an animal world. Not animals living in a human world. It’s evident that an immense amount of thought and research has gone into Zootopia’s architecture, and the book showcases early sketches and concept art for the different towns and cities within it, along with insights into its development. We learn that in an early iteration of the film, for example, prey animals were dominant, so the motifs in building focused on this, incorporating vegetable patterns, leaf shapes and flower murals into the design of the buildings. Each area is discussed in detail, from Tundra Town, that’s made of snow and ice and incorporates Russian and Italian influences in its construction, to the tiny mini-city of Little Rodentia, where streetlights are made from a single Christmas lightbulb. Foxes’ thought processes overlap with their actions, something artists tried to capture with Nick Wilde. The Art of Zootopia is also packed with detail about character design, with back stories and insights for major and minor characters. We hear where lines were drawn between reality and artistic licence. For example, in nature, otters are bulkier than weasels and look like they have one big muscle. But Mrs Otterton needed to appear frail enough to ask for help, so the artists gave her thinner wrists and neck. Broader issues are also discussed. How does a herd of wildebeest dismount from a train? Which animals can and can’t wear trousers? How can an ice cream shop cater for elephants? In short, each of the 164 pages is full of amazing art and fascinating insights into the making of a landmark animation. Anyone interested in character design or world-building should find this a riveting read. This review was originally published in ImagineFX magazine issue 137. Buy it here.